According to the latest statistics released by the South African Department of Environmental Affairs (DEA), South Africa has already lost 57 rhinos to illegal poaching since the beginning of 2013. 42 rhinos were poached in the Kruger National Park, six rhinos got illegally killed in the North West, six in KwaZulu-Natal, two in Limpopo and one in Mpumalanga. Of the 18 suspected poachers arrested since 01 January 2013, 11 were arrested in the Kruger National Park and three were fatally wounded. Three suspected poachers have been arrested in Limpopo following a tip-off related to their activities in the Kruger National Park and two in North West. Rwanda's flag carrier, Rwandair, will resume direct flights on the Mombasa (Kenya) <> Dubai (UAE) route. From 02 February 2013 the airline will operate three weekly flights on board a Boeing 737-800 between the two destinations. As a result of the revised schedule, Rwandair will reduce its nonstop service on the Kigali (Rwanda) <> Dubai (UAE) route form currently seven weekly flights to four weekly flights. Passengers can hop-on and hop-off of at any of the six stops along the route and experience the activities on offer - wine tasting, cellar tours, lunches, or simply a stroll through the vineyards. A commentary guided tour, focusing on the history of Franschhoek and wine cultivation in the valley, and a complimentary wine tasting, are included. The Franschhoek Wine Tram operates daily from 10:00am to 3:20pm, with departures every 40 minutes. Ticket prices are R130 for adults, R65 for children 5 to 17 years of age, and no charge for children four years of age and under. Enjoy! Johannesburg will be hosting the second annual Jozi Film Festival between 15 - 17 February 2013. The first festival on the yearly South African film festival calendar showcases the latest films made by Johannesburg and Gauteng filmmakers, as well as provides a space for filmmakers, local or international, to tell stories about Johannesburg and her inhabitants. This year, the Jozi Film Festival will take place at three venues: The Bioscope in Maboneng Precinct in Johannesburg's CBD, Villa Arcadia in Parktown, and an open air screening in Kliptown, Soweto. The festival opens at The Bioscope on the evening of Friday, 15 February 2013. The opening night film will be "Fanie Fourie's Lobola" (see trailer below). Tickets for the festival are a mere R20 and some screenings will be free. All films screened will participate in a competition; the competition categories include: Best Feature Film, Best Feature Documentary Film, Best Animated Film, Best Fiction Short, Best Documentary Short, Best Student Film, Audience Choice Award, and best Mobile Phone Film! update (05 Feb 2013): AfricaStay has teamed up with South African low-cost carrier Mango to operate charter flights to Zanzibar. From 12 March 2013 AfricaStay will offer charter flights on every Tuesday between South Africa (Johannesburg?) and Zanzibar (same-day return). A Saturday-operated flight is also planned over December. According to Tourism Update, the flights will be well priced and it will be possible to book flights only. According to ch-aviation.ch, South African budget airline Mango is planning to launch a weekly serice between Johannesburg and Zanzibar from 26 February 2013. The airline has already published schedules for flights to its first international destination, but has not yet started taking reservations. Mango, a state-owned subsidiary of South African Airways, is currently South Africa's most punctual domestic airline and the only airline in Africa offering on-board Wi-Fi. The carrier is operating scheduled budget services to and from OR Tambo International Airport and Lanseria International Aiport in Johannesburg, as well as to and from Bloemfontein, Cape Town, Durban and Port Elizabeth. The airstrip of the Makokola Retreat, located at Lake Malawi north of Mangochi and Nkopola, is Malawi’s third international airport. International charter or private flights can now fly directly into Makokola and clear customs and immigration right at the hotel. The runway can take anything up to ATR 42, Dakota DC 3 and King Air aircrafts and offers the possibility of refuelling for both Avgas and Jet A1 fuel. The other two international airports in Malawi are Chileka International Airport in Blantyre and Kamuzu International Airport in Lilongwe. Located in the heart of South Africa's Cape Winelands and only about 20min from Cape Town, the Spier Village and Wine Estate is not just a normal wine estate - the so-called "Spier Experience" combines wine, food, art, culture, nature and, of course, conservation. Guest visiting Spier can lounge on the lawns on the banks of the Eerste River with a picnic, or visit their innovative farm-to-table restaurant Eight. One can taste Spier's award-winning wine paired with delectable treats, or enjoy the welcoming comfort of their spacious, village-style hotel. If you are coming to Cape Town, rent a car, drive to Stellenbosch! and visit Spier, one of South Africa's oldest and most unique wine estates! According to a media release issued by South African National Parks (SANParks), the Mapungubwe National Park in Limpopo, South Africa, has re-opened its doors. The park was closed on Monday, 21 January 2013 due to heavy floods and has now been reopened to the public. Only the museum (the Mapungubwe Interpretive Centre?) is currently still closed, but will reopen later in the week. Although mop-up operations are still underway, all camps in the Mapungubwe National Park, including Leokwe and Limpopo Tented Camps, are open and ready to welcome guests. Motorists in the park are advised to drive cautiously and stay within the demarcated roads as the roads are still wet and slippery. The park is open for day visitors everyday between 06h00-18h30. Privately owned South African airline Airlink will commence scheduled direct services on two new over border routes, Johannesburg <> Kasane in Botswana and Johannesburg <> Vilanculos in Mozambique from Friday 22 March 2013. Johannesburg <> Kasane will operate initially on Monday, Wednesday, Friday and Sunday departing OR Tambo International Airport at 11:45 and arriving back in Johannesburg at 15:50. From August 2013 the service will operate daily. Johannesburg <> Vilanculos will operate initially on Monday, Wednesday, Friday departing OR Tambo International Airport at 10:30 and arriving back at 15:40. Tuesday and Saturday flights will be added in July or August 2013. The inclusion of these two new regional routes brings Airlink's route network to a total of 31 destinations serviced, of which 17 are over-border destinations. South Africa's winelands, the oldest in the so-called new world, are among the most popular tourist destinations in the whole country. The heart of the winelands in South Africa is the Western Cape, particularly the southwest corner of the province near its coastal region. The area, known for towns like Stellenbosch, Paarl and Franschhoek, with its long, sun-drenched summers and mild, wet winters, has ideal conditions for a wine industry combining the classicism of the Old World with the contemporary fruit-driven styles of the New World. But it is not only the climate of the winelands, it is also the soil and the unique geography which includes several inland mountain chains and valleys, that is making South African wine so outstandingly good and popular worldwide. Travellers who are planning to visit the winelands and its historic towns will find the following videos, produced by South African Tourism, quite helpful and interesting as they provide a very good introduction to the wines of South Africa. Enjoy! 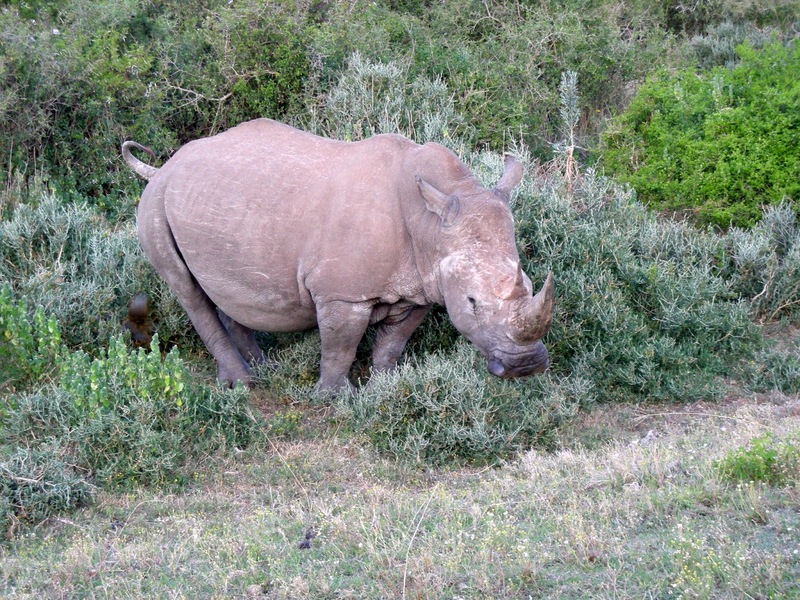 According to the latest statistics released by the South African Department of Environmental Affairs (DEA) and South African National Parks (SANParks), South Africa has already lost 32 rhinos to illegal poaching since the beginning of 2013. 18* rhinos were poached in the Kruger National Park, six rhinos got illegally killed in the North West and five in KwaZulu-Natal. Two rhinos were poached in Limpopo and one in Mpumalanga. 13 people have been arrested in relation to rhino poaching in 2013 so far. *The Kruger National Park figures includes carcasses of rhinos killed in 2012, but only discovered in 2013. Ethiopia's flag carrier, Ethiopian Airlines, will adjust its operations to Zimbabwe and Zambia. From 27 January 2013, the airline will operate three out of its seven weekly flights via Lusaka (Zambia) to Harare (Zimbabwe). The airline is currently routing all its flights to Zimbabwe and Zambia via Harare to Lusaka and then back to Addis Ababa. update (07 Oct 2013): The remainder of the S63 route along the Luvuvhu river and Crooks corner viewpoint at Pafuri Camp is now open after the January 2013 floods. update (11 Sept 2013): Good news coming from the northern part of the Kruger National Park: The Pafuri Border Post/Port of entry is now open. update (01 July 2013): South African National Parks (SANParks) has released a new update on the flood damage situation in the Kruger National Park (21 June 2013, 10:00). The Sirheni and Shingwedzi Camps have been partially reopened, as well as some key roads, namely S50 (Shawu Road past Kanniedood Dam, S134 (Shingwedzi Round Road) and S57 (Sirheni Road). update (25 Jan 2013): South African National Parks (SANParks) has released a new update on the current flood situation in the Kruger National Park (24 Jan 2013, 18:00). The S106, for example, is open again, so that it is possible again to travel between Orpen and Satara. update (24 Jan 2013): South African National Parks (SANParks) has released a new update on the situation in the Kruger National Park (23 Jan 2013, 16:30). Guests inside the park are kindly urged to use water sparingly as camps/gates and picnic spots in many areas operate on emergency pumps and boreholes with limited capacity. Berg- en- Dal, Crocodile Bridge, Letaba, Lower Sabie , Malelane, Mopani (via Letaba only), Olifants, Orpen (only accessible from Orpen Gate - no internal access from KNP), Pretoriuskop, Punda Maria (only accessible from Punda Maria Gate – no internal access from KNP) & Skukuza. Bateleur (flooded & access),Balule (services), Biyamiti (access), Maroela (access), Roodewal (access), Shimuwini (partially flooded & access), Shingwedzi (major flood damage), Shipindane Hide (access), Sirheni, Sable Dam Hide, Talamati (partially flooded & access), Tamboti (fencing & access) & Tsendze. update (23 Jan 2013): South African National Parks (SANParks) has released a new update on the situation in the Kruger National Park (23 Jan 2013, 13:00). Guests inside the park are kindly urged to use water sparingly as camps/gates and picnic spots in many areas operate on emergency pumps and boreholes with limited capacity. South African National Parks (SANParks) has issued an update on the current situation in the Kruger National Park (as of 22 Jan 2013, 09:00am). According to the update, emergency plans are running accordingly and SANParks is constantly monitoring the developments. There have been no reports of any major incidents throughout the park. All gravel roads in the Kruger National Park have been closed off for safety and motorists are requested to stay on tarred road. Thx to youtube user exRanger7 for the video footage! Tenth issue of free "Safari" digimag out now!